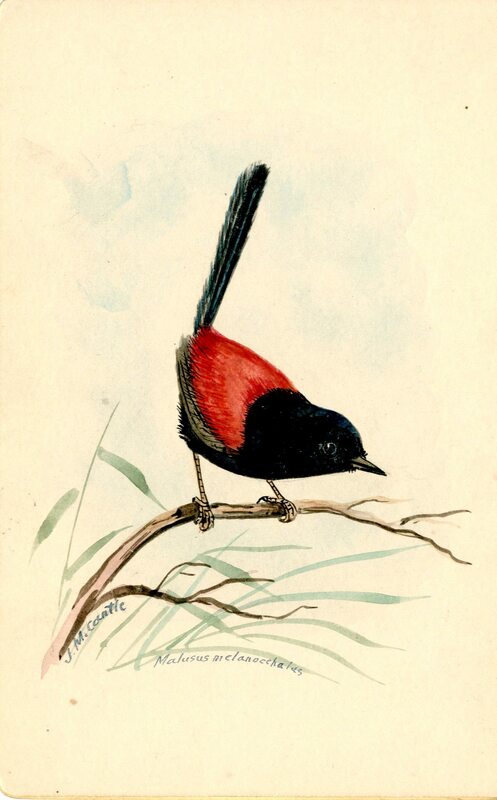 The beauty and diversity of Australia’s birds are vividly captured in one of the Royal Commonwealth Society department’s most colourful collections of artwork (RCMS 278/7). They were created by John Mitchell Cantle (1849-1919), a native of Sydney who was employed as an architectural draughtsman and railway surveyor. 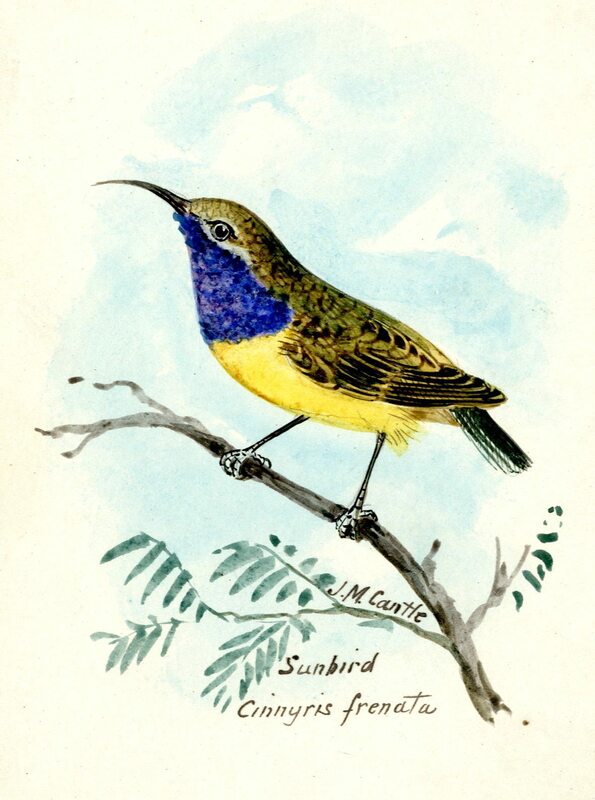 Cantle developed a parallel career as an important early ornithological painter, illustrator, cartoonist and postcard designer, sketching from observation while employed by the railways in the bush around Sydney and eastern New South Wales. We’ve selected Cantle’s painting of one of Australia’s most famous birds, the Laughing kookaburra, as a featured image, named for the striking ‘laugh’ by which family groups declare their territorial claims in the face of rivals. 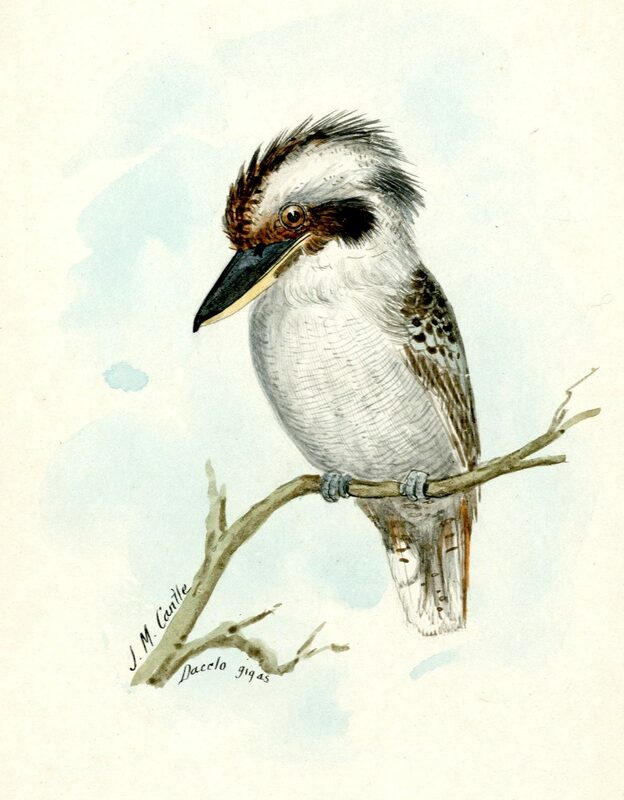 Many will have grown up singing Marion Sinclair’s much-loved children’s song, the ‘Kookaburra Sits in an Old Gum Tree’, written for the Girl Guides’ Association of Victoria in 1934. The rock band Men at Work reproduced parts of ‘Kookaburra’ in the flute riff of their massive hit single ‘Down Under’, which topped the world charts during the early 1980s. Cantle first exhibited his work in 1883, and between that date and 1918, created several hundred watercolour and gouache paintings of birds. He was associated with the Australian Museum, Sydney, producing illustrations of some of its specimens, including several non-Australian birds. The RCS possesses fifteen watercolours on gilt-edged card, each 105 x 165 mm in size, which record the species depicted, but are undated. Sadly we do not have any of Cantle’s postcards. It would be very interesting to hear from those institutions or individuals which do, whether these watercolours were reproduced as part of the series. A full listing of the Cantle paintings may be found here.